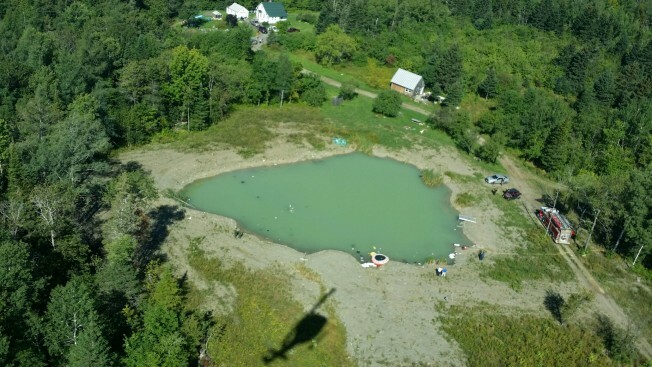 The wreckage of a plane was found in this manmade pond in Houlton, Maine, on Thursday morning. The pilot is presumed dead. Maine State Police say they have found the wreckage of plane that crashed in the area of the Houlton International Airport and the pilot is presumed dead. The plane was found in a small manmade pond off White Settlement Road in Houlton. The plane's wreckage and the pilot's body have since been recovered, police tell WBLZ, adding that the tail numbers match the those of the plane believed to have crashed. The pilot was the only person on board. The plane was upside down in the pond, and all that was visible is one wheel of the aircraft. It was found on Thursday morning as searchers on the ground came upon the pond and noticed floating debris. The twin engine aircraft was reportedly due in to Houlton from Canada at 1 a.m. but never arrived. Police said the plane appears to have clipped some trees and then flipped over into the pond. State police, the Maine Forest Service and the U.S. Customs and Border Patrol assisted in the search for the plane.